Our friends and fantastical songwriters Sam Russell, Casey Ruff, and Bart Cameron got together, called themselves The Cupholders, and started recording tunes. Now they’re releasing their first EP, called Tractor… at The Tractor (duh!) and we’re delighted to be sharing the bill with them! Double or Muffin will be opening up the night. Don’t miss this ol’ fashioned barn burner of a night at the infamous Blue Moon this Thursday, 9/27! 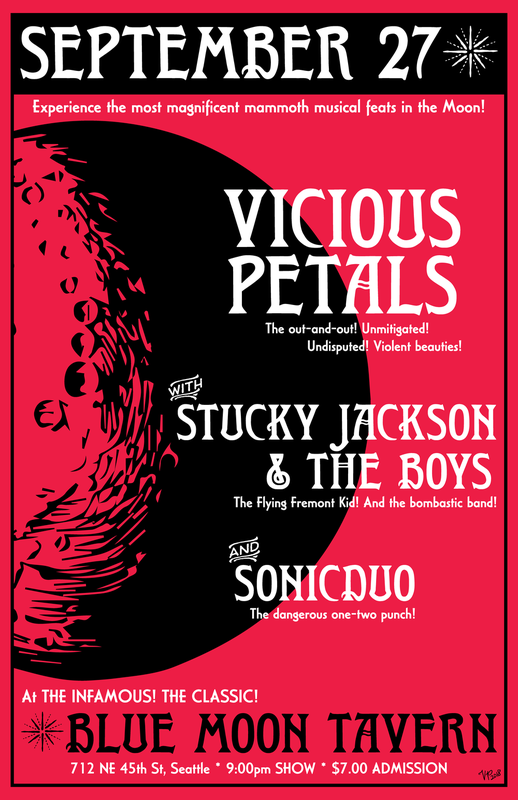 We’ll be sharing the stage with our good friends Stucky Jackson & the Boys and SonicDuo. We're coming for you, Portland! Thanks to pals Santiam for putting a sweet 🎃👻 costume party together! SAT 10/29 at Laurelthirst Public House (2958 NE Glisan St, Portland OR 97232). This Sat at the Blue Moon! We're very excited to add the fantastically fun Sebastian and the Deep Blue to the line-up for our Blue Moon show this SAT 10/1. Come get rowdy with us at one of Seattle's favorite ol' haunts. Brian Kenney Fresno, a troubadour with tales of modern urban legends and epics of the absurd, opens up the night. We will be celebrating the official 180-gram double-LP release of our first full-length album, Main Street Lights, at our beloved Sunset Tavern on Saturday 8/27, with special guests The Echolarks and Tape Stacks. This has been an amazing journey from the beginning - starting with the first tunes that we wrote together, all of the special special people that have encouraged and supported us, our wonderful and amazing band who have been such great musical inspirations, the unforgettable almost month-long time we spent at Bear Creek Studio recording these songs to two-inch tape with the inimitable Ryan Hadlock and ever fantastic Jerry Streeter, obsessing over mixes and artwork and design and driving ourselves mad... And we couldn't be more proud of what we made. If you're a vinyl junkie like we are, you'll want to come get these beauties in your hands! If you're not in Seattle, fret not! We'll ship it to you, lovingly packaged in reinforced mailers. Just hit us up here on the site. Album release show ticket link HERE! So so many thanks to everyone who came out to our vinyl listening party on Tuesday! We're so grateful and ecstatic for the support and excitement for our record. We look forward to seeing y'all at some shows! Much appreciation goes out to our pals at The Sunset for hosting and keeping us all hydrated. Speaking of shows... We have a couple of fun ones coming up in July, in addition to some release announcements and other exciting stuff. JULY 9 // SATURDAY: We're very happy to be playing the wonderful Royal Room in beautiful Columbia City, with our badass buds The Kings! Doors at 9:30pm, show at 10pm, 21 and over. (There's a suggested donation of $10.) It's not often we get to play a venue with a proper grand piano, so don't mind Ayako if she's ridiculous and giddy. JULY 23 // SATURDAY: We're back at The Sunset for a show with the lovely Annie Ford Band. Santiam from Portland will be opening up for us. 9pm, 21 and over. Advance tickets available here! We hope to see all of your beautiful faces out!